The Canucks had a comfortable lead with just more than a minute to go when the center was called for interference. As he sat in the box, Horvat worried his penalty would spoil a clean sheet for goalie Jacob Markstrom. It didn't. The 6-foot-6 Swede stopped all 29 shots by Anaheim for his first shutout of the season. "I felt so bad when (the penalty) happened," said Horvat, who scored twice. "I was just so happy that he ended up getting the shutout there. I wouldn't have been able to forgive myself." 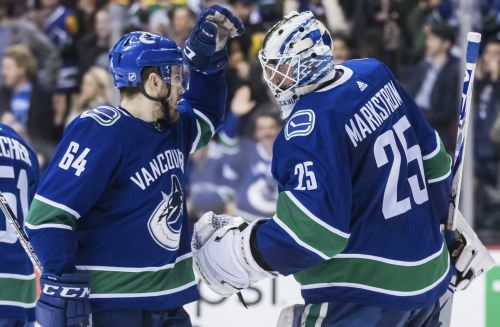 "Big win," Markstrom said. "We've been playing good but haven't got the goals we wanted. Today I thought we played a really good game for 60 minutes and it shows on the board." Kevin Boyle made 25 saves but the Ducks dropped their third in a row. "It weighs on you," assistant coach Marty Wilford said. "We are all competitive people and everybody wants to win, so obviously it's weighing on you and you can't have that defeated mindset when you fall behind like, poor me I can't come back. We just can't accept losing." Anaheim is nine points out of a playoff spot. "We are not going to feel sorry for ourselves or make excuses or let people make excuses for us," center Devin Shore said. "It's tough sledding but we've all been through situations where things don't go your way and you can't hope your way out of it, you have to work your way out of it." Canucks coach Travis Green didn't realize his starting netminder hadn't posted a shutout yet this season. "I didn't even know that was his first, to be honest," he said. "He's had such a good year that he probably deserves a few more and you are happy for him." The shutout was nice, Markstrom said, but the victory was a total team effort. "It means that we won the game," he said. "It's nice to get one, for sure, but that mirrors how we played defense and played the game." The 23-year-old Horvat has a career-high 23 goals this season. "I'm far from the peak of my career," he said. "I think I still have a lot of work to do, a lot to improve on and I'm just trying to get better day by day." Goldobin has been in and out of the lineup this season as the coaching staff challenges him to work on his game away from the puck. It's been a tough stretch, the right wing said, adding that he wants to stay with the Canucks. "I like this organization and I know coaches believe in me a lot. I like the guys here. I feel like I'm home here," he said.